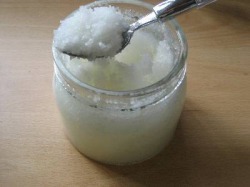 An exfoliant (like salt or sugar) in an oil base that rubs away the dead skin cells on the surface, revealing the softer, younger cells just below. My scrubs are hand made by me and tend to leave your skin softer because I use natural and mostly organic ingredients. During the scrub, I can work areas you can't reach easily, like the middle of your back. After the scrub, which is done on the table, you are invited to rinse in a warm shower. It is important to just rinse. Soap dries the skin and counteracts the effects of the scrub. Scrubs are recommended for dry skin or those that tan often. Scrubs may be contra-indicated if you are sun burned or have an infection or abrasion of the skin. My custom blended scrubs will soon be available for purchase.